Happy Thanksgiving Friends! This time of the year always has me reflecting on what’s important. With everything going on in the world this week, I feel more grateful for my family, friends, health, happiness and a safe place to call home. This year we are spending Thanksgiving with some amazing friends and family. We have a couple of friends with a true gluten allergy. 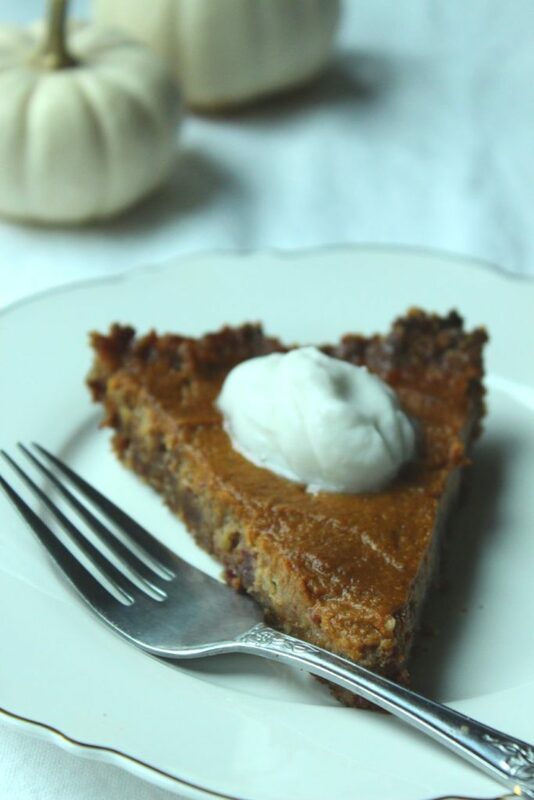 Pumpkin pie is a staple for my family at Thanksgiving and this year I made a delicious gluten, dairy free pumpkin pie. My mom makes the best pumpkin pie hands down. I asked her for the recipe and initially the dietitian side of me thought how can I make this a healthier version. Luckily, I stopped myself from messing with a good thing (Ok, I cut back the sugar content a little bit). You see the thing is we don’t just eat to nourish ourselves we also eat for other reasons such as celebrations. We don’t eat dessert regularly, I am totally good with that because we call this a “sometimes food’ in our house. I know come Monday morning I will be going out for an early morning run followed by a bowl of baked oats. Thanksgiving is once a year and we are going to celebrate good food with amazing friends and family. Place pecans, oats, cinnamon, salt and dates in a food processor and pulse until crumbly but sticks together when pressed between your fingers. Lightly spray a small pie dish. Add pie crust to the dish, flatten out the crust with your fingers. Mix all pumpkin pie ingredients in a large bowl, whisk to ensure they are mixed. Pour pie filling into pie dish and bake for 30 minutes. For the crust I went with pecans, gluten free oats, and dates. 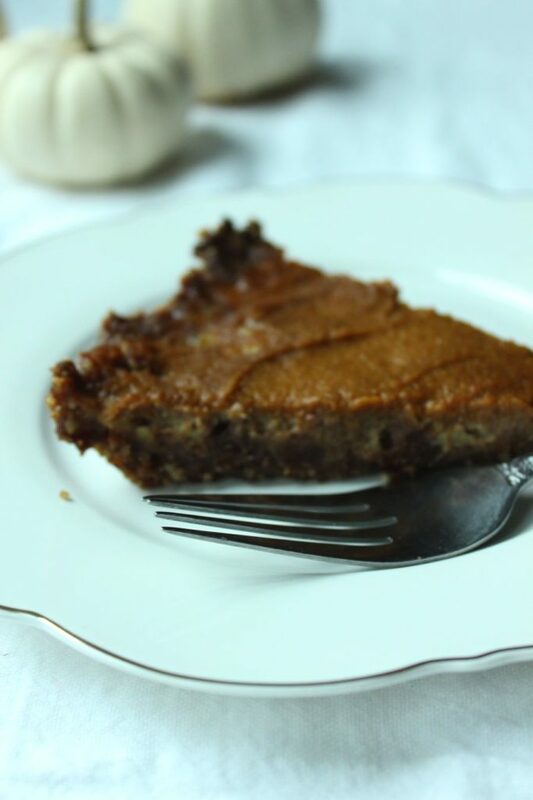 This gluten free crust is much easier to make than your traditional pie crust, no kneading required. 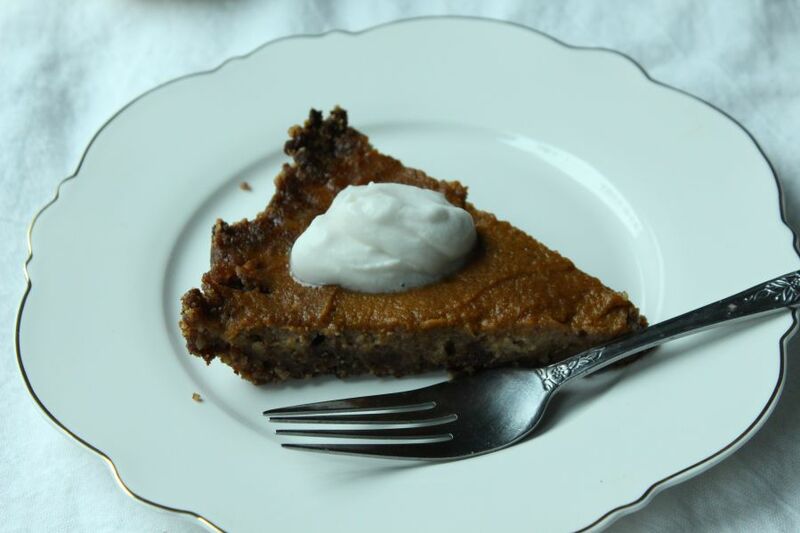 I used unsweetened almond milk for the pumpkin pie filling but you could easily substitute for any milk dairy or non dairy. Finally, for the whipping cream I used a coconut whipped cream recipe from minimalist baker, Miss E really enjoyed the coconut whipped cream. If your planning Thanksgiving dinner and need a little inspiration I found some amazing recipes like this kale and brussels slaw with quinoa from sprouted kitchen, I saw this hasselback squash on Erin Ireland’s instagram stories this week, you can find the recipe here. If your looking for ideas on what to do with all that leftover turkey I suggest this turkey pot pie from foodess. And if you really want to impress your dinner guests I suggest making these white buns from Fraiche nutrition.